Although we know that he drew on many traditions and narrative precedents, Tolkein essentially provided the benchmark for the epic fantasy as a contemporary fiction genre. Since then such fantasy has proliferated in adult fiction. Although the stories produced have varied enormously in quality, the best are amongst the finest works of imaginative writing of our age. Epic fantasy has similarly been adapted for, or simply crossed over into, a YA audience. Philip Pulman's devastatingly wonderful His Dark Materials is perhaps the ultimate example. This is truly epic, but its sophisticated (anti)religious themes, drawing, sometimes obliquely, sometimes more directly on John Milton, probably require an audience at very least towards the oldest end of the children's fiction range and probably older. In contrast I am aware of hardly any recent examples of genuinely children's fantasy fiction that I would consider epic. By this I mean work which is not simply a long, possibly multi-part, sequence (of which there have been any number), but which is also vast in the scale of its concept and content. The true epic treats with matters of cataclysmic significance for an entire world or worlds, albeit ultimately resolved by a 'simple' individual and his or her companions. What such epic fantasy provides, perhaps more than anything, is a fully immersive experience where the reader becomes involved with a rich and complex world over an extended period of time, experiencing grand dramas both physical and emotional. The best are works of profound universal and personal resonance. Of course some children's writers have come close. The seminal Harry Potter sequence is certainly vast in length if considered as a whole, but its seven volumes only really encompass a relatively limited world; despite its ultimate 'big battles' it is essentially a school story with Hogwarts always at its heart. Toby Forward's wonderful, and as yet rather under appreciated Flaxfield (US: Dragonborn) Quartet, creates a rich and rewarding world, but it is also relatively contained. Other writers have brought aspects of the epic into the sphere of children's reading by using comedy to offset and lighten the impact of its evil and traumas. A good example of this is Angie Sage's delightful Septimus Heap sequence. Many others have taken the ordinary-kid-discovers-special-powers-and-saves-the-world aspect of the epic fantasy and presented it with more of the ethos of the comic book, if not actual comedy, or compressed its length in supposed deference to the audience. But little seems to have seriously captured the full scope of the truly epic fantasy and successful rendered it accessible to a children's readership. Little, that is, until Ian Johnstone's The Mirror Chronicles. Here now we have developing a true epic fantasy for children - and it is very special indeed. 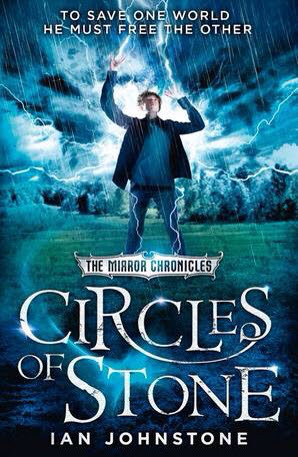 Circles of Stone is the second volume of what the author seems to have planned as a trilogy. I recorded my very positive response to the first volume, The Bell Between Worlds, earlier in this blog (see post from June '14). This second book is, in fact, very much a direct continuation of that first one, a true Part 2 rather than simply a sequel or a further book in a series. It therefore needs to be read after, perhaps ideally soon after, the first. Its rather gentle opening is the perfect respite, for protagonists and reader, after the high adrenaline climax which ended its predecessor; it would perhaps seem a slow start if approached separately. In any case the second book contains virtually no recap, so it is essential for any reader to be fully cognisant with the characters and events of the first. The pay off is a wonderful sweep of extended story. I often find that the middle book of even a great trilogy can be the weakest and most meandering. Inevitably it does not have the power and potency of either the beginning or the end, being, by definition, neither. But not so here. I found this second book an even more powerful and engaging read than the first. This is largely because Ian Johnstone skilfully uses the same authorial technique as does Tolkein in The Two Towers, a split narrative. The Mirror Chronicles is essentially a portal fantasy and treats of two worlds, roughly our 'real' world of science and the 'other' world of fantasy. As presented they seem separate but are ultimately interdependent and need to be brought back together. At the centre of this tale are the the 'mirror' halves, the yin and yang, of the same individual, one character from each of the story's two worlds, a boy Sylas and a girl Naeo. In the first book they find each other and experience for the first time the potential power of their united self. Now they split up again to pursue broadly parallel quest, each in the other's world, and seeking the other's missing parent. Their characters are wonderfully drawn and their developing interrelationship highly engaging. Therefore the constant shift between their exciting adventures, so often cleverly left at an intriguing or cliff-hanging moment, draws the reader on in a helter-skelter of compulsive excitement. This is compounded by the author's use of language, which, though perhaps never mould-breaking in style (in the way, say, of Black North or Half Bad) is nevertheless masterly. The way in which Ian Johnstone can vividly evoke a location and thrillingly capture high adrenaline action is mightily impressive. The world building of The Mirror Chronicles is very special too. Of course, being 'classic', post-Tolkein, high fantasy, the books draw on many archetypes of the genre. Here, for example, are to be found broad equivalents of Rivendell and Lothlorien, there is crucially a Sauron, with hoards of grotesque and gruesome minions, as well as a Galadriel and indeed several Gandalf figures. All of these root the story firmly in its genre and traditions but each is also given fresh and imaginative reinterpretation. Much previous fantasy writing has drawn on Celtic and Scandinavian sources for its characters and recreated mythologies. Others have tried, generally somewhat less successfully, to use Greek and Roman models. Ian Johnstone looks to the mythologies of Ancient Egypt for much of his inspiration, without tying himself to too literal a representation. This gives his world an excitingly different feel and sets up many powerful resonances. Thoth becomes his personification of ultimate evil and an Isis figure, his redemptive 'goddess'. He takes inspiration from an eclectic variety of other sources too though and succeeds in melding them all into a convincing and richly complex fantasy world. Many of Ian Johnsone's imagined or reimagined creations are quite superb, not least the double-helix spiral of a white marble tower that is the Temple of Isia, the black pyramidal Dirgheon and the wonderful but vulnerable sanctuary of the Winterfern Hospital. This latter must surely owe some inspiration to Cornwall's magnificent Eden Project, but, like eveything else, it is here turned into something quite breathtakingly magical. The extended climax of Circles of Stone is so vividly imagined and skilfully crafted that it is viscerally exciting and turns the later part of this instalment into an irresistible page turner. However, as is fitting for a children's book, there is a good deal of consoling resolution to be found at its end, albeit achieved at considerable cost. Heart-warming reunions are made, but Thoth's war still looms and 'the black' continues to seep into the world. Part 3 awaits, hopefully not too long away. There are hints that it will centre around a visit to Egypt, and it's equivalent in the 'other'. As a life-long Egyptophile, this makes an already exciting prospect doubly so. In Circles of Stone, what could potentially have been rather disparate elements are strongly held together by the story's key concept of the two related 'mirror' worlds and especially by the personification of these in Sylas and Naeo. They are inspired creations and the developing interrelationship of these two (one?) is absolutely fascinating and quite beautifully handled. There are many other strong and engaging characters too, with often moving relationships developed. These all give the book a very 'real', human feel despite its fantastical context. The issues of the divided world are real too. How science and fantasy relate and need to be reconciled, indeed unified, is something that matters. This is a book to excite and engage children, but also one to make them think; to imagine but also to reflect. Ian Johnstone uses skilfully crafted language to weft his own highly imaginative and original yarns through a warp of classic fantasy archetypes. The result of this weave is the richest of narrative tapestries, epic in scale and vibrantly alive in colour, texture and figuration. His sequence thus far achieves every aspect of the immersive and all-consuming read that is epic fantasy, whilst still remaining a genuine children's book. However there is clearly more to come. The Mirror Chronicles now needs only a completion which maintains the qualities demonstrated in its first two parts for the whole to become one of the great works of children's fiction. My only regret, as a collector as well as a reader of children's fiction, is that there is currently no hardback of this second volume to stand on my shelves alongside that of the first. Less selfishly, an important work of this quality surely needs an edition with more enduring and aesthetically pleasing presence than that provided by a paperback. Despite living in a largely disposable and e-media infused world, or perhaps because of this, our children too need to experience, at least on occasion, the feel, the heft, the smell, the joyful physicality of a beautiful volume.